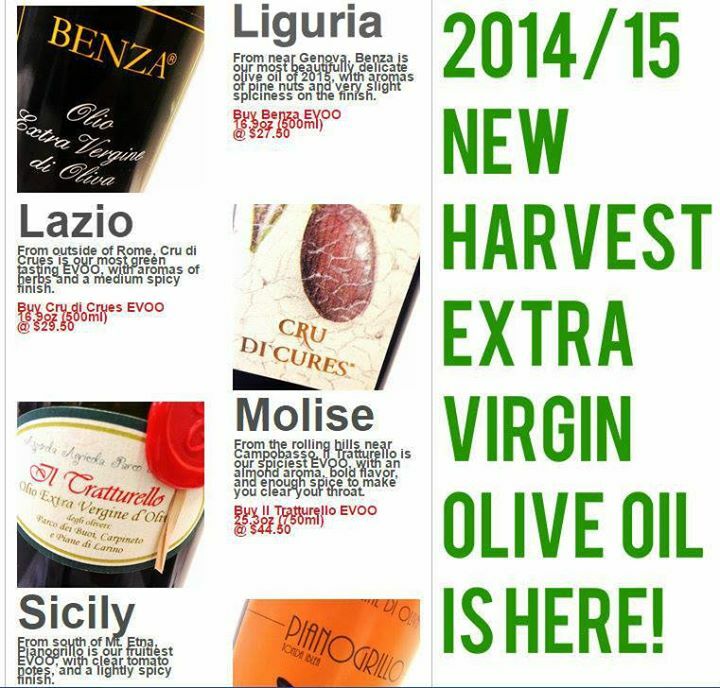 From north to south, 2014/15 New Harvest EVOOs are here. From near Genova, Benza is our most beautifully delicate olive oil of 2015, with aromas of pine nuts and very slight spiciness on the finish. From outside of Rome, Cru di Crues is our most green tasting EVOO, with aromas of herbs and a medium spicy finish. From the rolling hills near Campobasso, Il Tratturello is our spiciest EVOO, with an almond aroma, bold flavor, and enough spice to make you clear your throat. From south of Mt. Etna, Pianogrillo is our fruitiest EVOO, with clear tomato notes, and a lightly spicy finish. Click here to read more about it in our newsletter; and to sign up for our newsletter type your email address into the white box at the top of this page and click submit (don’t forget to confirm your subscription!). Previous Post New Year, New Extra Virgin Olive Oil. They’re here!